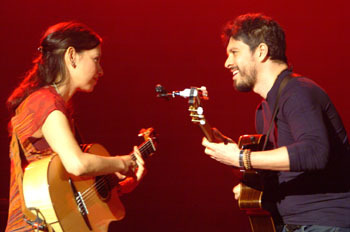 This Mexican pair have proven a phenomena, and just about everyone bar the mainstream music press has twigged. They have their fans in the rock world, the folk world, even Metal Hammer and The Guardian, their previous eponymous studio album went gold, the current album has received universal rave reviews, so why they aren�t Word or Mojo cover stars is anyone�s guess. The aforementioned new album features 11 tributes to guitarists who have influenced the pair, and that is what the emphasis was on this evening, and man was it electrifying! The approach was less formal this time, no chairs for them to sit on, the pair either stood, walked around or sat casually on strategically placed onstage equipment. But no matter, the performance was outstanding. Two nylon strung acoustic guitars have never before made such a racket, nor had so many people cheering and clapping along. It didn�t take much arm waving from Rodrigo to whip up a frenzy. 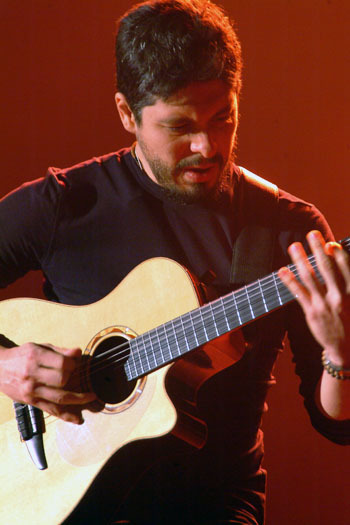 Rodrigo�s lead was fast, furious, intricate, while Gabriela�s rhythms were hard and frantic. 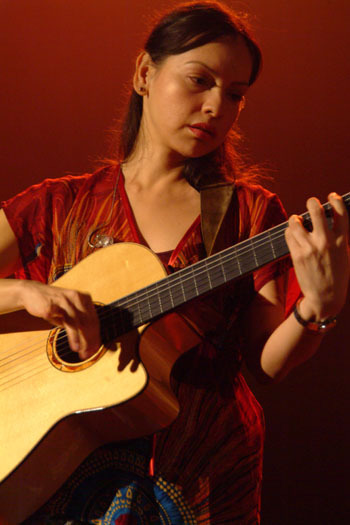 Most guitarists break strings, Gabriela tries to smash her guitar with her bare hands. Literally. That�s no drum, it�s her guitar body taking the punishment. The music was played with passion, a range of rhythms (some middle eastern, and elsewhere Spanish without being flamenco), and 'Diablo Rojo' 'Hanuman' (dedicated to Carlos Santana) stood out. The playing nodded to Hendrix and Blackmore later too. It�s like world music meets heavy metal, a phenomena you really need to witness first hand. There was less reliance on cover versions, although there was the odd bar of Led Zeppelin and The Who thrown in to the several jams/medleys/solo spots, and Metallica�s 'Orion' (the only full cover) proved as popular as ever. 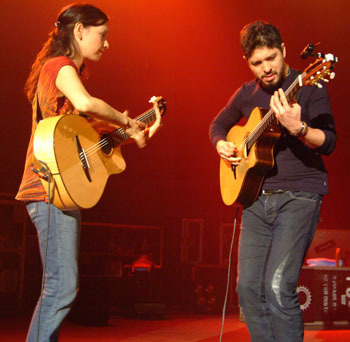 Rod and Gab, as they are affectionately known to those in the know, honed this style moving from thrash band to busking, and it works so well. The show finished with a rousing rendition of 'Tamacun', a track so popular with fans that the crowd were singing the guitar parts. 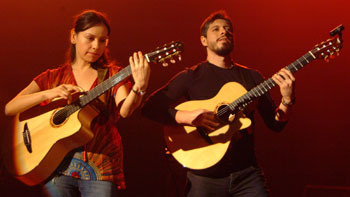 Both Rodrigo and Gabriela occasionally talked to the crowd, something they could do more of in a 100 minute instrumental set (which did appear to use the odd guitar effect), but even with no talking at all, this would still be electrifying and captivating beginning to end. Teenagers metal fans wearing 11:11 t-shirts, enthusing next to people old enough to be their parents, and a very very full and enthusiastic Apollo, I think tells you everything. Phenomenal.